Be the top hog in this fun slots game. Click here to play! See if you can spin the reels to break open the piggy bank for a major Porky Payout! Stick close to Porky the pig as this rich swine guides you toward a massive pay out. This classy pig is a wild symbol and not only substitutes for most other symbols, but will also get up to 15000 times your line bet if you can spin two to five of him across an active pay line. Porky's extravagant lifestyle will certainly attract the babes. Spin two or more piggy beauties across an active pay line to get up to 5000 times your line bet. Two to five hot rod hog rides will pay out big, bringing in up to 1000 times your line bet. Jewels and cigars will also pay out so don't overlook those valuable symbols. Though, perhaps the most valuable symbol in this piggy world is the Porky Payout icon. This scatter will not only multiply your total bet if you can spin two or more anywhere on the board, but it will also trigger a bonus feature if you spin three or more anywhere on the board. Spin these reels to live high on the hog in Porky Payout! The golden, gleeming Porky Payout icon is a scatter and will multiply your total bet by 2, 5, 20, or 100 if you an spin two to five anywhere on the board. The smarmy Porky pig is a wild and will replace most other symbols (not scatters) to help you create more wins. He will also pay out up to 15000 times your line bet if you can spin two or more anywhere on the board. 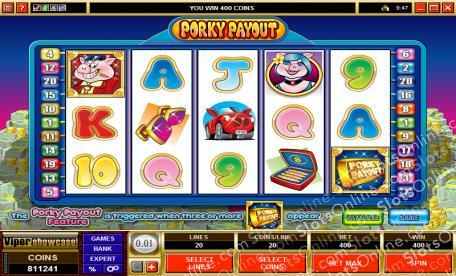 Three or more Porky Payout icons anywhere on the board will trigger a bonus feature. During this feature you will get to choose six Porky Payout icons to reveal an amount. Your choices will be added up to form your bonus prize.